Do you know what lurks inside your upright piano? Dust? Pencils? Lost treasure? 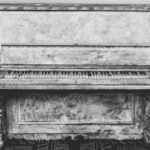 If you’ve never cleaned your upright piano then it might be time to find out what exactly is hiding inside. Cleaning an upright piano isn’t that hard if you have the time and the right tools. You’ll be protecting a valuable and possibly a beloved family heirloom. 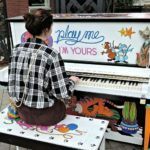 Upright pianos have their own special challenges when it comes to cleaning so we’ll cover the other types of pianos in another article. You’ve probably done some dusting but it’s getting inside that’s the tricky part. We’ll go through things step by step to get your upright piano clean and free of hidden surprises. When it comes to everyday cleaning of your upright piano there isn’t much to do. You’ll want to to treat it like a piece of fine furniture which means regular dusting and the occasional deeper cleaning. Dusting: Clean dust off your upright piano weekly to not only keep the surfaces clean but to prevent buildup from being pushed into the interior. A dry cloth or a duster work the best. Cleaning: If you need to clean spills or fingerprints off your upright piano then a damp cloth is usually the best. If you want something with a little more ‘oomph’ use a mild soap. Murphy’s Oil Soap is made for finished wood and can be picked up from Amazon. Polishing: It’s actually recommended that you don’t use cheap furniture polish like the common lemon dusting sprays. These are bad for the finish of your upright piano and can make cleaning difficult in the future. 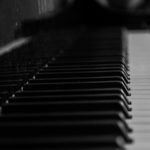 If you really need a polish on your upright piano then you’ll need to know what kind of finish your piano has applied to it. Lacquer: A lacquer finish, usually found on American made pianos, requires a high end furniture polish. Make sure that it’s formulated for lacquer finishes and follow the directions. Polyester: Other pianos are made with polyester finishes that seem to be almost plastic. These are super glossy finishes and sometimes an easy way to make a fancy looking black piano. The best way to polish these upright pianos is to simply clean them. Small scratches can be buffed out with products made for plastic, automotive applications. Painted: If you’re cleaning an old, upright piano where somebody has painted it then don’t use polishes. The finish is unsealed and any products you use will break down the paint. Just clean it with a dry cloth. Obviously, the piano keys are the part that will receive the most attention from your fingers. Clean your piano keys with a damp, almost dry cloth. What you want to avoid is getting water down between the piano keys since the wood there is unsealed. Unsealed wood will soak up the water and cause it to swell. 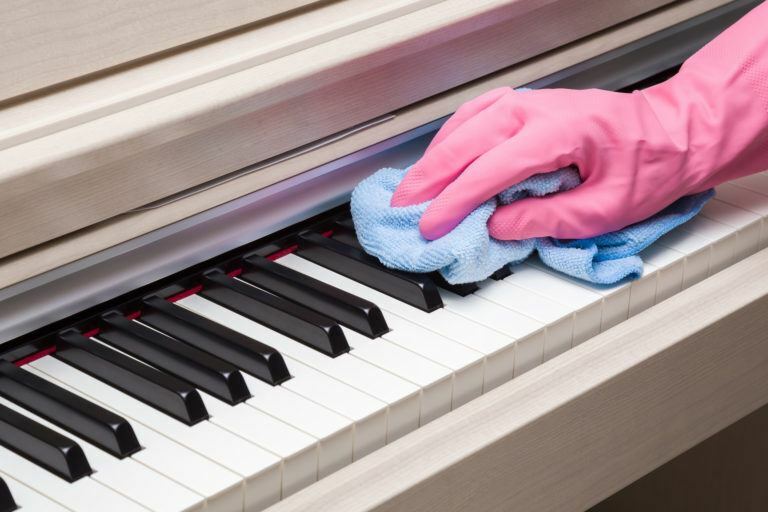 Clean all the white keys with one cloth and use a separate cloth to clean the black keys on your upright piano to avoid transferring smudged paint. Vacuum: A vacuum with a hose and some attachments is a must. Your standard household vacuum should do the job nicely and come in handy for cleaning up the floor afterwards as you’re sure to make a mess. Compressed Air: Air in a can, like the kind you find for cleaning electronics, is great for blowing dust out of those tight spaces. When you get inside your piano you’ll find out quick there are tons of tight spaces. Screwdrivers: You may need to remove some parts with a screwdriver and which may be a flathead or phillips head. After you’ve assembled these supplies you’re ready to get inside. Step 1 – Open the Top: Open the hinged, top cover of the piano and lean it against the wall. Next see how the the top panel is attached. It may be held on by hinges that can be disengaged by flipping a lever or they’ll be screwed into the side boards. Remove the top panel and set it aside. Step 2 – Clean! Clean this part of your upright piano by first going over it with the vacuum with a brush adapter. Get the big stuff first then move on to spot cleaning with the compressed air to bust up bigger dust deposits. Just be careful around parts so you don’t damage anything with the vacuum attachments. If need be, use a dry rag to wipe things down. Don’t use sprays inside the piano! You’ll hurt the unsealed wood and metal parts. Step 3 – Open the Bottom: The bottom panel under the keyboard should easily pop out by depressing a small lever located in the middle at the top. If you don’t have a lever then look out for screws. Remove the panel and set it aside so you can get to the real cleaning. Step 4 – Clean! Cleaning the bottom portion of your upright piano is going to be the toughest part. Here you’ll find all the things that have been lost inside over the years. This could be a few pencils or as bad as dead mice. Pick out the larger items then vacuum and use compressed air to get the rest. Again and I can’t stress this enough; don’t use spray cleaners inside your piano! You never want liquids inside any piano. When you’re done cleaning your upright piano it’s a good time to see if anything is damaged. You might not be up for a full repair job yourself but if you’re feeling brave there are some simple things you can do yourself. Pick up a piano repair book and see what you can do yourself. You could save yourself hundreds of dollars by skipping a repairman for the easy stuff. Once you’re done, reassemble the piano and clean up the area around it. You’re all set! Get back to playing and enjoying your clean upright piano.